It seems that everyday we see and hear someone endorsing a person, product, political or religious platform from one category or another. Promotion and advertising companies seek preeminent individuals with familiar names elevated to the roles of stardom in one realm or another. When we watch television, the commercials soon appear selling products or soliciting our time to watch other shows or "specials"
. We soon feel inundated after only 5 minutes in front of our super sized high definition screen with 6 speakers, 30 key remote control and 10 cup coffee maker. The America we live in today is certainly much more complex than it was in the time of our grandparents. Many of them had come here from other countries to start over. We have become subservient to an endorsement of one kind or another before we sense we can safely make a statement of how "we feel"
, call a doctor, talk to an attorney, support a certain sports team, read a new book, buy designer clothes or even attempt to talk with God who created us. 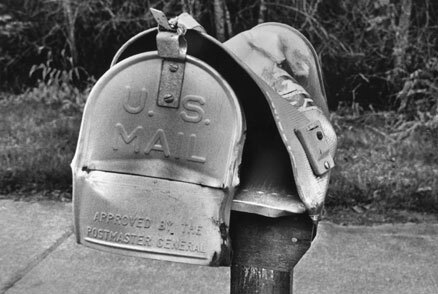 Interestingly, The Postmaster General approved this collapsed Peace Arch City postal box that now only takes in "junk mail"